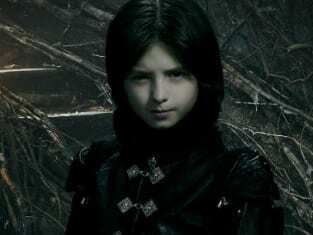 If there is one thing we learned tonight on Salem Season 3 Episode 5, the dark lord has a serious case of an Oedipus complex. Poor Mary! As if things couldn't get any worse for our Queen Witch, she has to deal with this bombshell by her "somewhat-dead-totally-evil" son. This offer isn't exactly surprising in hindsight — the dark lord has been hinting at his love for her for a while. Still, his choice of Mary must stem from a mysterious place. Dark Lord: And to fulfill the promise of your existence. Mary: I do not understand. Dark Lord: My father took on a suit of flesh, he required two Marys -- one to birth him and one to love him. But I only need one Mary. You...my mother...and my bride. Permalink: But I only need one Mary. You...my mother...and my bride. 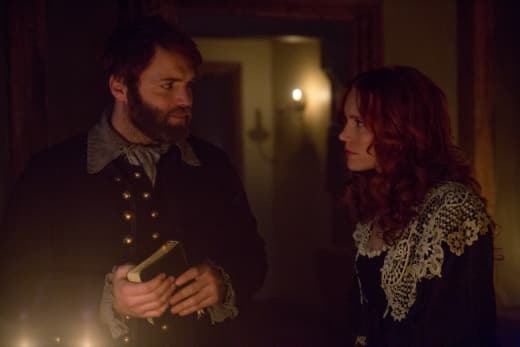 Does anyone think John Alden and Mary play a bigger part in the dark lord's plan than once thought? During Tituba's confrontation with the dark lord at the end of the episode, she made a point of having to bring Mary back AND send John Alden away to get a reward. These are two important moves to keep destined lovers apart. It seems fishy. 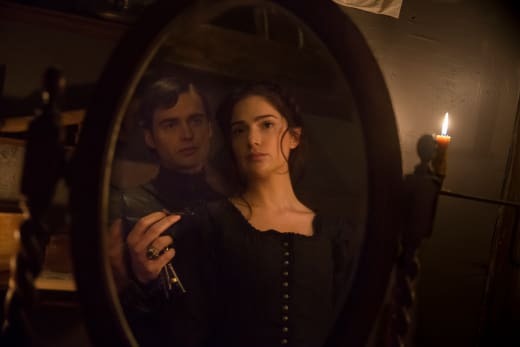 The chemistry between Janet Montgomery and Oliver Bell as mother and son, as well as between Montgomery and Shane West, are some of the best character interactions on Salem. Their combined relationships feel like a dysfunctional family. And yet it felt very uncomfortable hearing Bell tell Montgomery he wanted her to be his bride. That moment heightened the creepiness of his character. Speaking of creepy characters, let's all agree to never trust Tituba again. The evil witch just lies and lies! Many questions were answered on this episode of Salem, and many of them were due to Tituba's shadiness. She is, in fact, the traitor! Tituba is the mastermind spinning the web and manipulating the players into doing exactly what she wants them to do. 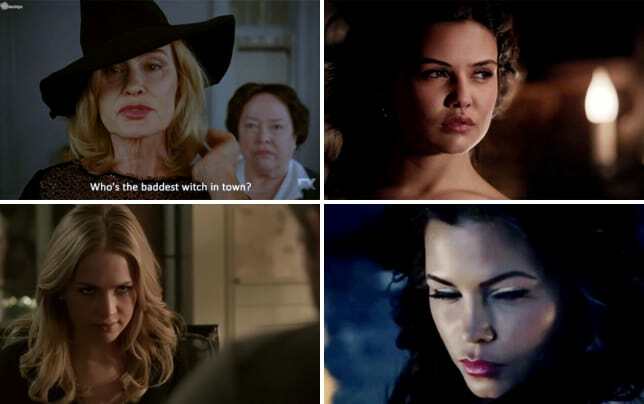 I quite enjoy a love-to-hate villain — Tituba is one. Though, I do hope The Sentinel or Mary give her her just desserts if she tries to kill him. The scene of her visiting the Essex Witches and orchestrating the death of an innocent witch is a highlight of the episode. Not just because it was visually appealing (the special effects of the tree attacking him were spot on! ), but because of the revelation in hindsight. She is the evil one lying to everyone, including Mary and Cotton, and relaying information to the dark lord. Tituba: As if he knew you were coming? Tituba: You are in greater danger than we could have known. If you would survive, trust no one. Mary: You examine the Essex Witches, leave me to make my first move. Mary: Why to trust no one, of course. Permalink: Why to trust no one, of course. Did anyone guess Gloriana would be the one pregnant with Cotton's child? I, for one, had some hope it was Anne — I didn't think Gloriana would come back. But this news opens up more of Anne's evil side. Let's face it (myself included): Cotton and Anne might not have a happy ending. The shipping of this romance needs to be put on hold. Anne looks desperate enough to do away with Gloriana, and Cotton came back for the baby. They can't survive this drama. The storyline of Cotton now having to write the biography of the dark lord's battle is an interesting development. He is so devout, but he's also a sarcastic character. There must be shady one-liners hidden away in that manuscript. Anne should hope he never finds out the truth. Cotton: The Devil wants me to be his biographer, to recount his glorious failed rebellion against the "tyrant" God. It is a cosmic joke! Anne: But I am grateful that he has spared you, almost as grateful as I am...that you spared me. On this episode of Salem, we also got to explore more of the side stories and romances. It's a nice change of pace to breathe in between the brewing battle storyline. 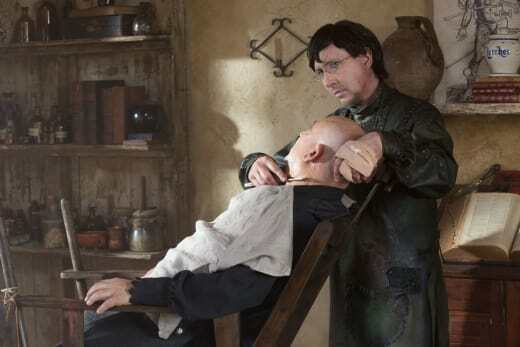 And it was fun to see Marilyn Manson return as Thomas just to kill Mr. Putnam. Thoughts on Billy: Grieve or goodbye? We finally learned the truth about her character, but I didn't shed a tear. It was too little too late after five episodes to get everything a few seconds before her death. And what was with that kiss? It felt completely random and out of character as she's dying. At least when Mercy was near death, she felt repentant and looked to change. Magistrate Hathorne is stupid for not taking the cure. He could be both with Mercy AND cured! This isn't an "either/or" scenario. We finally got a glimpse to the extent of her power with the acolytes. Like every season before this, Mercy has no trouble getting women/girls to join her cause. I can't wait to see how she uses her followers in the future! The same can be said for the outcome of Sebastian giving Mary's blood to the Countess Von Marburg's skeleton. The affection between Sebastian and Mary is growing, even if John Alden looks to be her endgame. But blood is a powerful tool on Salem. Let's all cross our fingers the Countess rises to join the cause. While her skeleton looked cool and truly terrifying (the image of Sebastian making out with it is haunting), Lucy Lawless is sorely missed. It was great to hear her voice again and deliver such blunt quips. Oh life is wasted on the living. I could make love better as a corpse than you in your prime. Give her what she wants before she even knows what she wants. And then soon enough, she'll want you. What did you think of "The Witch Is Back"? Will Mary go through with the wedding? Should Mercy give Magistrate Hathorne the cure regardless? Will Tituba kill The Sentinel? 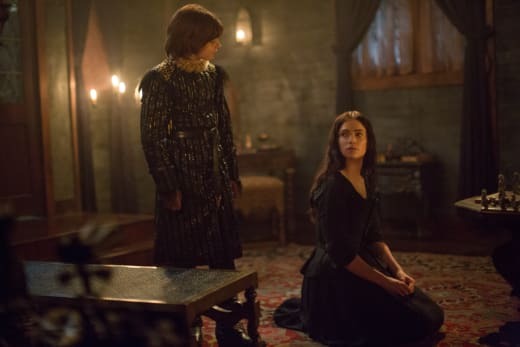 If you missed the latest episode of Salem, you can watch Salem online via TV Fanatic. Come back to let us know what you think.